In 2016, opposition leaders claimed Rohith Vemula’s death symbolised BJP’s discrimination of Dalits. Today, Congress & Left have given the issue a miss in Telangana campaign. 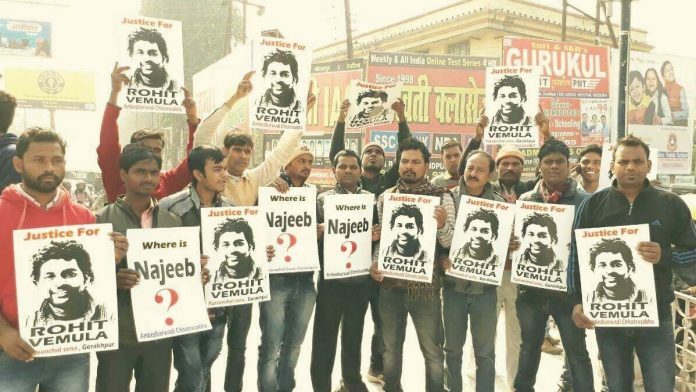 Rohini Swamy: When Dalit scholar Rohith Vemula allegedly committed suicide at the University of Hyderabad in January 2016, his death not only shocked academia but also galvanised the opposition against the Modi government. A number of opposition leaders, particularly from the Congress, made a beeline to the University of Hyderabad campus to show solidarity and claim that Vemula’s death was symptomatic of the discrimination that Dalits were facing under the Modi government. Fast forward two years, with elections in Telangana, there is no mention of the Dalit scholar whose plight had found national resonance. None of the opposition parties, from the Congress, the Telugu Desam Party (TDP) to even the Left, have raked up Vemula’s death. There has been no mention of Vemula in the Telangana election campaign even though all of the political players are going all out to woo the backward classes and Dalits. Prof. Vishweshwar Rao, a well-known academician from Osmania University, feels that Vemula should have been made an issue. Rao believes that though Vemula’s death did take the Dalit debate to a national platform, it was not enough. “It has to be brought to a logical end by paying more attention to the community. Around 90 per cent of OBCs and Dalits drop out of school after either Class 5 or Class 9. Should that not be addressed?” he asked. Political analysts believe that Vemula may turn out to be a non-issue in the assembly elections but may find more traction in the Lok Sabha elections because the issue was largely seen as one between the Congress and the BJP. One of the main reasons for Vemula not been spoken about in the poll campaign, analysts say, is that the Telangana campaign is seen as a contest between the Telangana Rastra Samithi (TRS) and the Congress-Telugu Desam Party (TDP) alliance, with the BJP a smaller player. Hyderabad-based political analyst Palwai Raghavendra Reddy believes that since it is a straight fight between the TRS and the Congress in the state, Vemula’s issue would not make much of an impact.